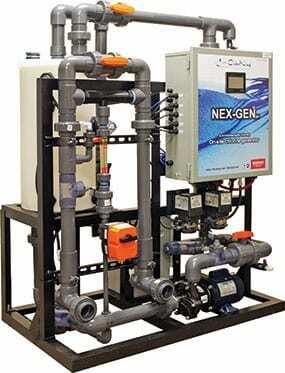 NEX-GEN Onsite Generadores Cloro - ChlorKing, Inc.
ChlorKing® NEX-GEN chlorine generator systems are designed specifically for commercial swimming pool applications. Ranging in sizes from 5 – 80lbs per day, these ChlorKing generators are ideally suited for all commercial swimming pools and water parks. The unique design, simplicity and ease of use make this line of generators the most viable alternative to traditional chlorine available on the market today. NEX-GEN technology is the only viable solution to produce sodium hypochlorite on-site as the pool water becomes the raw material for production, instead of fresh water and water softeners. Imagine all the chlorine your facility requires, being made on-site and having the ability to feed multiple pools from a single chlorine generation system.